Getting to the Rio San Juan from Guatemala City was slightly complex, consisting of almost thirty hours of actual travel time, by way of two taxis, three buses and one boat. 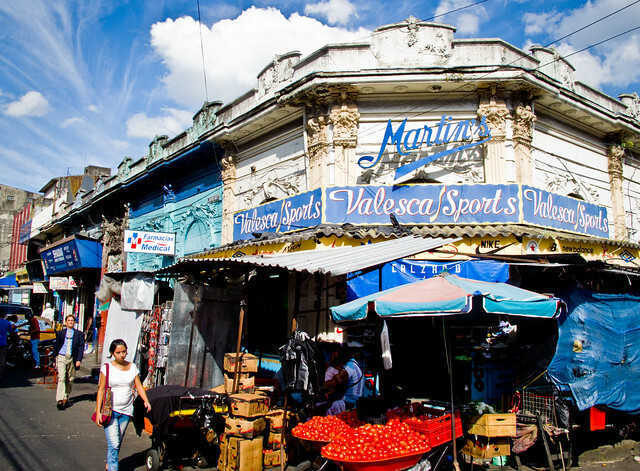 Our first leg of the voyage fortunately allowed us almost an entire day in San Salvador, El Salvador. Here we spent the afternoon exploring the market-lined streets of the crowded city. The El Salvadoran people seemed to notice us a lot more than in most other places we have been to previously. While we got a few odd glances or presumed glares, most everyone was much more friendly and interested in interacting and joking with us as we walked by. After a few hours of catch-up sleep at the bus-station hotel we departed on a 3 am bus for a thirteen-hour trip out of El Salvador, into Honduras with its steep rolling hills and plateaus, and finally to Managua, the capital of Nicaragua. Here we were greeted by thousands of people in the streets celebrating the re-election of Daniel Ortega. Joining in for the inaugural activities was the president of Iran, Mahmoud Ahmadinejad, as well as the president of Venezuela, Hugo Chavez. Even though we skipped the festivities in the streets, we still only had a wink of sleep before our next departure at 4 am to San Carlos, the tiny port town at the mouth of Rio San Juan. 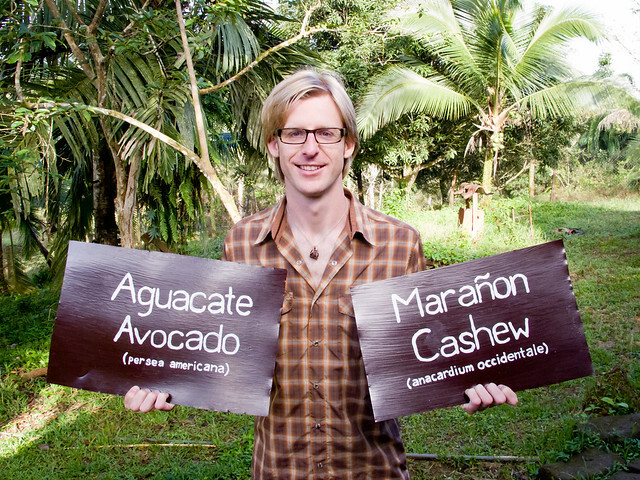 One has three options when traveling in Nicaragua between Managua and San Carlos. 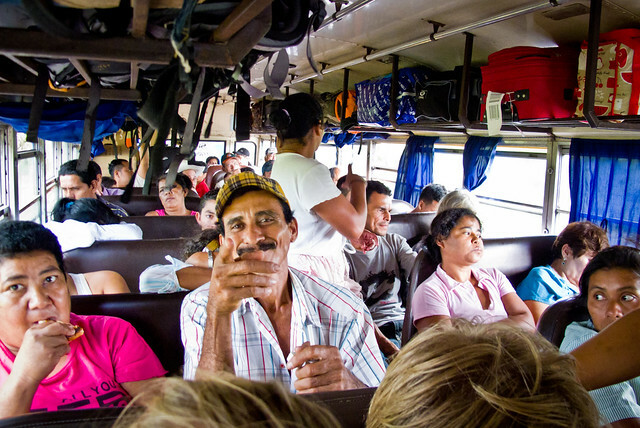 We chose the 8-hour chicken bus ride around the eastern coast of Lake Nicaragua over the 14-hour (and terribly reviewed) ferry ride or the 45-minute, more costly plane trip. Stopping at most every little town along the way, locals jump on to preach or to sell a variety of everyday items, and sometimes both. 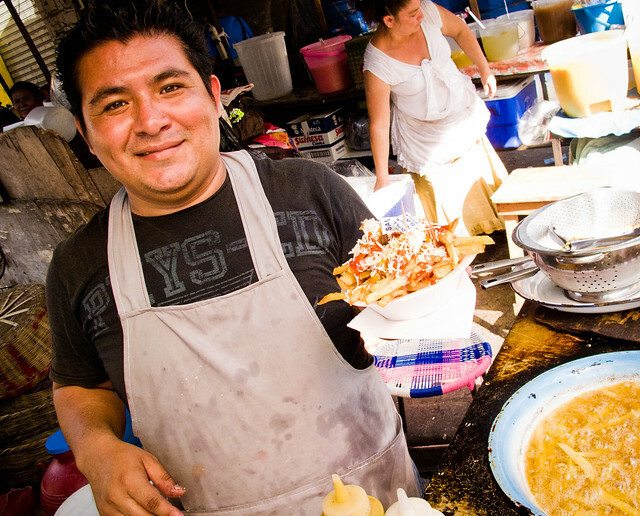 But we prefer it when they sell food: fried sweet breads, sodas, fresh coffee, sandwiches, tacos and more delicious treats. To finally reach our base for the next two weeks, from San Carlos we took a two-hour, over-sold public boat trip down the river, soaking in all the sights of our new environment. Immediately it was obvious that Alfonso took a strong environmental approach to the construction of his lodge; it was built entirely out of fallen trees from the surrounding forest. It also operates on 90% solar power with only a diesel generator to provide energy a few hours after sunset each evening. 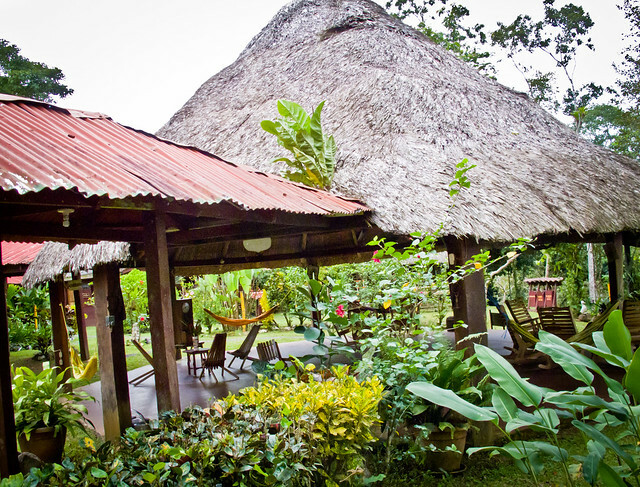 Coconut, banana, star fruit, cocoa, and various citrus and nut trees dot the land around the lodge and produce food for the staff and guests while the chickens and pigs provide some of the meat and eggs. 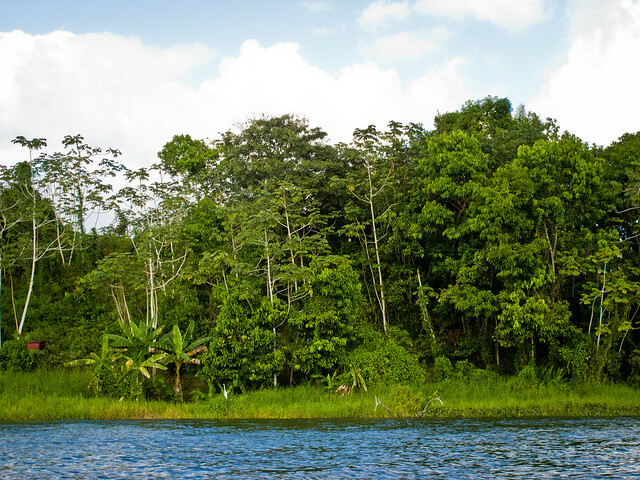 Guests can take part in a large variety of fun activities here: participating in the reforestation project by planting trees, kayaking and canoeing on the river, and horseback riding and hikes through the jungle and butterfly gardens. Tarpon, or Sábalo Real as they are known to the locals, are one of the many fish that live in the Rio San Juan, however they’re definitely an interesting species and one that makes this river quite special as well as a prime destination for sport fishing. Tarpon can be found in both fresh and salt water and are found in a few places around the world, on the Atlantic Coast from Virgina to Brazil, throughout the Gulf of Mexico and Caribbean and also throughout southeast Asia, Japan, Tahiti and Australia. 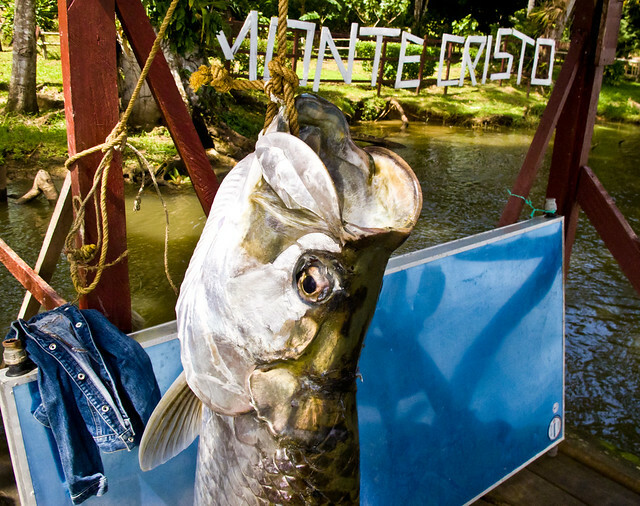 These massive fish grow from five to eight feet long and can reach almost 300 pounds. Luckily we had the opportunity to see one up close, a tarpon of over 100 pounds, that one of the guests caught after fighting it for over two hours. 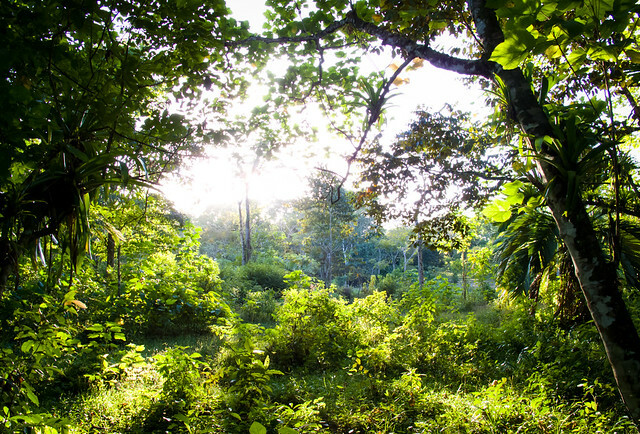 Waking up to the sounds of the jungle is easily one of the most incredible and wondrous parts of being in the rainforest. Every morning beginning just before sunrise, we hear the ferocious-sounding calls of the howler monkeys, the loudest sound in the animal kingdom (we have read that the howls can be heard clearly for twenty miles), as well as dozens of unique and beautiful birds. The sound of rain is another constant here, brief showers falling throughout the day completely ignoring the fact that the dry season began one month ago. 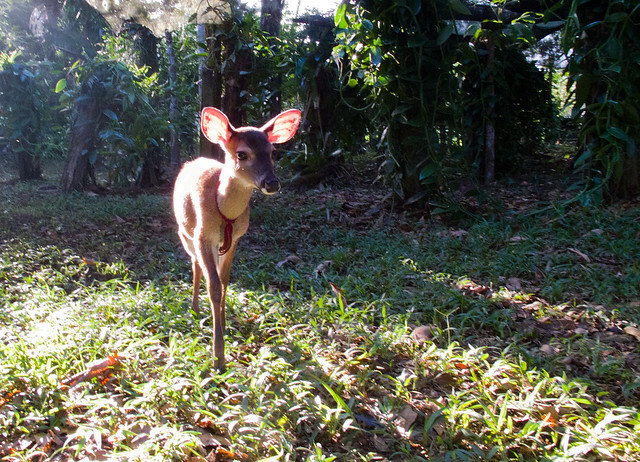 From time to time, forest rangers and environmental teams give Alfonso animals to care for until they are mature or healthy enough to be re-introduced into the wild. Currently, he is taking care of a very young white-tailed deer; we definitely took a liking to this tiny, spotted fawn and enjoyed our bottle feeding sessions in the greenhouse. As you can expect with wildlife, the majority of the animals that surround us we haven’t had the opportunity to see, such as tapirs, peccaries, quetzals, three-toed sloths, anteaters and the cats- pumas, jaguars, and ocelots. However, with patience and a bit of luck, we hope to see more of the quiet, sneaky wildlife as we continue our travels south through Costa Rica, Panama and into South America. Fortunately, the two of us didn’t come across a live terciopelo (Spanish for “velvet”,) but the staff of the lodge did find and kill one during their work one morning. This pit viper, known elsewhere as the fer-de-lance, is the most talked-about in Central America due to its aggressiveness, prominence and lethal venom; the terciopelo accounts for 80% of all major snakebites in the area. On our walks through the jungle, ranging from early morning to the middle of the night, we did, however, see a host of other animals: a colorful iguana sun bathing high up in the trees, a kinkajou, toucans, parrots and parakeets amongst many other birds, and large families of curious howler monkeys feasting on river-side foliage. 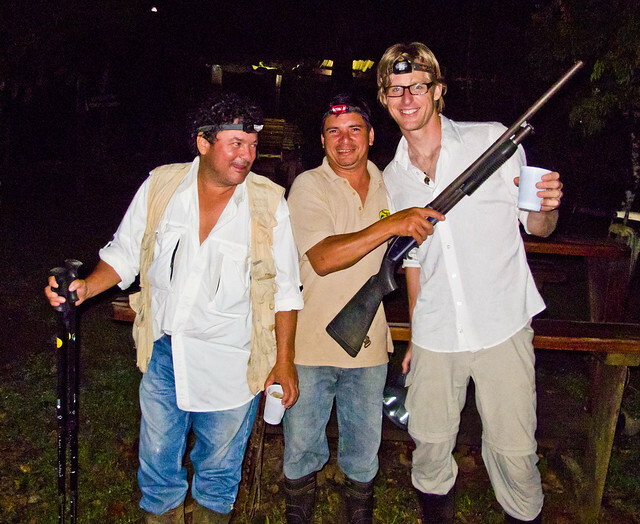 The kinkajou was a particularly special animal for us to spot during one night trek with Alfonso, as neither he nor the staff had ever before seen one. A completely nocturnal animal, known in the area as martilla, it is a member of the raccoon family and has large brown eyes and a velvet-soft golden brown coat. The kinkajou has a particularly nice life, in our opinion. It spends its entire existence feeding on fruit and honey in the treetops in the dark, and then drowses off at sunrise. We’ve read that if a person picks it up during the day, the sleepy animal’s first instinct is to cuddle against your chest and bury its head to drift back to sleep. Theresa can’t wait to find one to hold! 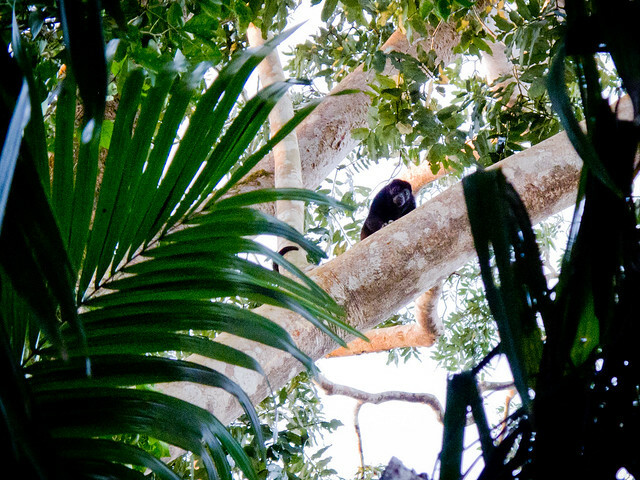 Unfortunately, we didn’t get a photo of the one we spotted climbing through the treetops, but we will keep our eyes peeled during our next night trek. While not exploring around we’ve been contributing on special projects for Alfonso, such as renovating signs made of bamboo and painting labels for the trees and plants throughout the property. We’ve really enjoyed leaving our mark with these projects and have had a wonderful time working alongside the staff. 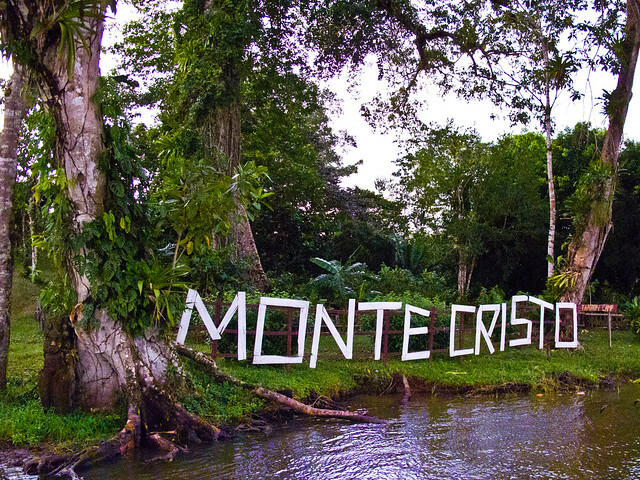 From Monte Cristo we’ll be making our way back upriver to San Carlos, and then south via the Rio Frio that runs from Lake Nicaragua into Costa Rica and the town of Los Chiles. We will spend a day or so in Los Chiles figuring our plan out for Costa Rica and will update everyone on the Traveling Forward Facebook page once we nail down our next destination. It was a pleasure to have you volunteering at my lodge and you are welcome to stop over again on your way back up to the U.S. I finished putting the signs you made around the trees close to our lodge. As you can imagine, I do need to make lots of them due to the variety of plant life here in the rain forest. So you did make your mark around our place and it will be appreciated for years to come by all our guests. Once again I thank you for a job well done. I had trouble seeing all the pictures at home, they didn’t download all the way. I am at a Drury Inn in St Louis tonite and they downloaded so fast and I really enjoyed them. love you. Please be safe. The picture’s looked fantastic ! Good thing I was listening with my headphones on ! You guys are living the dream !